A spacious and well-presented four bedroom mid terraced family home, located in the popular residential area of Ifield, close to local amenities and Ifield train station. Entering through the recently replaced front door, you are greeted with a spacious porch way with space for shoes and coats with a large converted utility room to the front which houses a washer/drier with eaves storage overhead. In the hallway you have a cloakroom with low level WC and wash hand basin. A door off the hallway leads into the main living room. The living room is of fantastic proportions and can comfortably house a corner sofa, large double glazed window overlooking the front aspect, as well as a feature electric fireplace taking centre stage with wood effect laminate flooring. Heading through to the rear of the property you find the kitchen/diner which has been completely replaced in 2016 and features a range of wall and base units incorporating cupboards and drawers with work surfaces over, a Rangemaster style oven with extractor hood over and bespoke tiling, integrated dishwasher and space for a American style fridge/freezer with an oversized breakfast bar incorporated into the design also. There is further space for a six-seater dining table and double doors lead out to the rear garden. Ample storage in the hallway leads to the stairwell where you head up to the first floor. 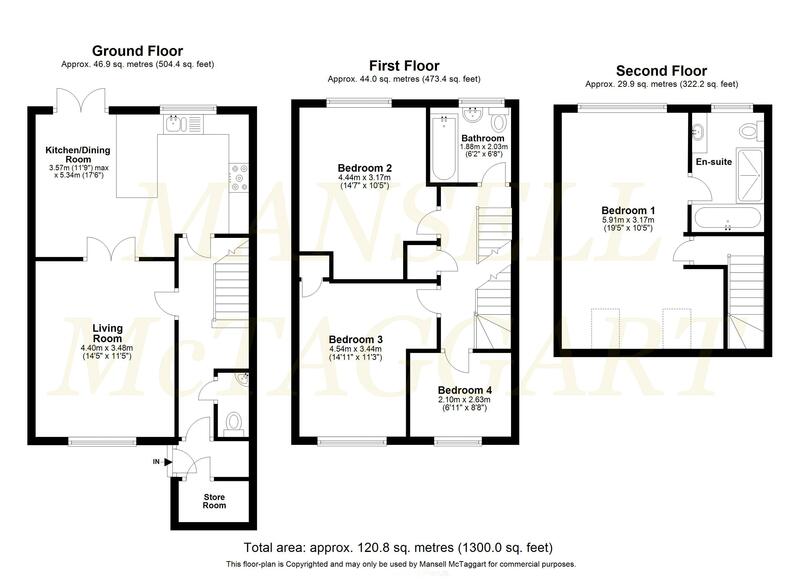 On the first floor you have three of the four bedrooms, two of which are substantial doubles and the second benefits from very large floor to ceiling full length built-in storage and overlooks the garden respectively. The third also houses a double bed and overlooks the front respectively with a handy storage cupboard. The final bedroom on the first floor is the fourth which is a comfortable child’s bedroom and holds a single bed but is currently being used as a study. The bathroom has a full length white panelled bath with power shower over, low level WC, wash hand basin, fully tiled and opaque window. Heading up to the second floor which was a complete conversion by the current owners and been done to an exacting specification and has space for a super king bed and still retains some eaves storage, two Velux windows and a further window off the dormer all allow in plenty of natural light. Completely replaced carpets and fire doors throughout all floors. The en-suite has been bespoke made for the extension and has almost full tiling in a handcrafted blue slate, a large double shower cubicle with in-built tiled shelving and separate bath resides within the room. There is a low-level WC, wash hand basin, heated towel rail and an opaque window completes the room. Heading outside to the rear garden you have a lovely area of wooden decking with a water feature, The remainder of the garden is laid to lawn surround by wooden picket fencing, the real feature resides to the rear where you find a very spacious external office with full power, heating and Wi-Fi, the perfect child’s playroom or home study. To the front you have two off road parking spaces on the driveway, as well as ample guest spaces in the road. The vendor is suited. Early viewings highly advised to avoid disappointment.